In fact, advantages of reversing the sear goes beyond merely obtaining an excellent flavor. It goes to an extent of giving you a tender, browned and evenly cooked meat. 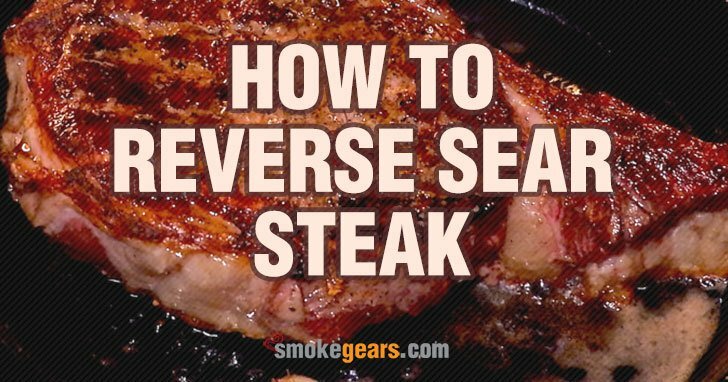 Let’s look into the steps of reversing the sear because it’s needless to say you’re going to need this process sooner or later. How to Reverse Sear Steak? Whether you are going to grill ribeyes (which most grillers love) or any other thick steak, seasoning is your introduction. Season it uniformly over all sides using pepper and salt. Then, you can now place on a wire rack which you have set in a rimmed baking sheet. In case you’re using the grill, you can skip the rack and pan. To invite better results, we advice refrigerating uncovered steaks overnight. In effect, this dries out the exteriors. Start by preheating your oven to any temperature ranging between 200 and 275 degrees F. Though rare, if your oven can hold temperatures below 200 degrees F, it can be better. There’s a paradox here. The lower you go, the more even your meat is likely to cook. But at the same time, the lower you go, the longer you will spend cooking. So, it’s you to determine if you want to have the best or have whatever you may have quickly. Definitely, quick results without quality end up in long-term frustrations. Better set it low and be patient to obtain the ultimate desires of your heart. Once you’ve set your BBQ in the outdoors, simply create a two-zone fire by banking a coal chimney under one side of your grill. Alternatively, you can simply turn on only half of your grill burners. Cover it up and allow for optimal pre-heating. Place your steaks in the oven and roast to a temperature of 10 to 15 degrees F below your preferred final serving temperature. You can use an accurate remote thermometer to monitor the temperature progress. In case you are using your grill, place the steaks over the grill directly on its cooler side. This allows gentle cooking via indirect heating. In order to realize excellent results, do not be adamant with fixed timing. It can vary in accordance with exact temperature maintenance ability of your grill. In line with this, frequently monitor temperature with your thermometer. Before removing your steaks from oven, add a tablespoon of vegetable oil or other such high-temperature friendly oil to a heavy skillet. Then preheat it over cast iron burner. No sooner should the oil start smoking than you add steaks plus a tablespoon of butter. Allow for optimum cooking until they’re nicely browned on one side. 45 seconds are enough for this. After this, flip the steaks to brown the other side, and then sideways to sear the edges. To finish up on the grill, you can remove the steaks followed by tenting them with foil as you build the biggest fire possible. If you’re using gas grill, switch the burners to the maximum with the lid placed down to preheat. Serve your steaks as you’d with traditionally seared steaks. Alternatively, you can choose to wait for a while. But the best delicacies are served instantly. Want to try to cook frozen steak? Learn here. The contest of reverse sear versus traditional sear is apparently coming to the point of resolution as the truth gradually comes out. Successful attempts by dedicated individuals have shown that reverse sear is far much ahead of traditional sear. It comes with uncountable advantages over the traditional searing of steaks. Talk of heat distribution in your steak, browning, and the general quality of meat, reverse sear is simply indisputable. Why again adopt traditional searing? With not so many words, reversing sear is the surest way to enjoy your steaks. To prove this, follow the steps above and test the results.